When brainstorming for a dog name you can gain a lot of insight from previous owners and the names that they have selected. The value in this trendy list doesn’t come from the names themselves but from the naming factors that lead them to the top. It is a combination of meaning, cleverness, cuteness, and usability that have made these names favorites for a new puppy. Our popular name list consists of the most used names of today along with some timeless classics. Popular puppy names come from the media not the neighbors. Many trends spread like wildfire through a neighborhood. Your neighbor Mike gets a microwave, so now you get a microwave. Your other neighbor Lisa got a new LCD TV. Now you either hang out at Lisa’s house or get your own. However, if your neighbor Mike names his dog Jake, you don’t name your dog Jake for obvious reasons. So how exactly does a dog’s name gain popularity? One of the primary amplifiers of name favorability is the media. 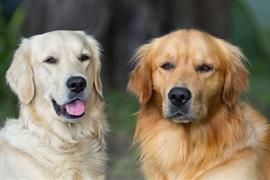 The names of dogs with starring roles in television, movies, cartoons, and books are great candidates for popularity. Not only do they have a wide reach, but they also have some associated characteristics in your mind. Max, which means ‘great’, is one of the most popular male dog names of all time. Max has gained favor for being short and having a positive meaning. The ease with which the name can be vocalized is a huge selling point to a new owner. Max is the dog on ‘The Little Mermaid’ and also from 'How the Grinch Stole Christmas’. Belle is a top choice for a female puppy. Belle means ‘a beautiful girl’ and, like Max, has a single syllable. Belle is Snoopy’s sister from the famed comic strip ‘Peanuts’. Some of our pages will contain a subcategory. A subcategory is a slightly more specific grouping than the main topic of the page. For a subcategory, we will include a separated table of names and corresponding descriptions. An example of a subcategory of Red Dog Names would be 'Dog Names Inspired by Red Wines'. If you have any subcategory ideas for the Popular Dog Names page, we would love to hear them. Use the form below to submit your ideas.